"Sharp witted dialog worth the watch, in this gorgeously animated adaptation of Shakespeare"
Theme Song: "Sigh no more, ladies, sigh no more. Men were deceivers ever. One foot in sea and one on shore, to one thing constant never. Then sigh not so but let them go and be you blithe and bonny, converting all your sounds of woe into hey nonny nonny." Beatrice Quote: "I had rather hear my dog bark at a crow than a man swear he loves me." The basic story involves the upcoming marriage of Count Claudio (Robert Sean Leonard) and the lovely Hero (Kate Beckinsale), and the behind the scenes attempts, to pass the time, to create a love match between a man and woman at odds with each other, who are confirmed singles, Benedick and Beatrice, (played by then real life husband & wife, Branagh & Thompson.) To complicate all matters, the bitter Don John (Kenau Reeves), brother of Don Pedro of Arragon (Denzel Washington), plans to ruin the wedding plans and stop the wedding of Claudio and Hero, by falsely accusing Hero of being unfaithful to her husband-to-be, through a misleading scheme, that nearly works. However, at the end of the story, everything turns out fine, making the whole incident "much ado about nothing." 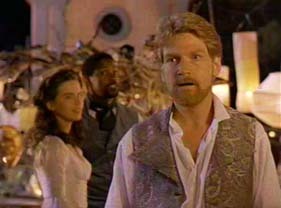 Based on William Shakespeare's play, Kenneth Branagh wrote and directed this entertaining comedy / romance screenplay. 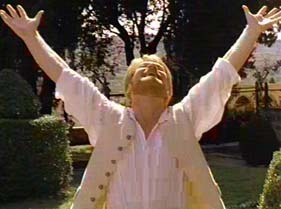 Branagh was ideally suited to adapt the play, star in, and direct this movie. Both the humorous and dramatic moments in this screenplay make the film a classic, as they are well written, well directed and well acted by a stellar cast. He added the hysterical bit with his character and the lawn chair, while eavesdropping what his friends are saying about Beatrice's feelings for him, which is one of my favorite sequences of scenes. The dramatic moments are also powerful, such as when Claudio accuses Hero of infidelity at the wedding ceremony, causing major havoc to all concerned. 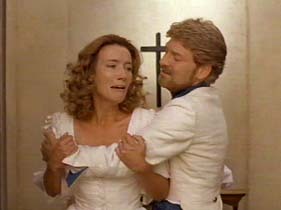 Equally gripping is the sequence of scenes where Beatrice convinces Benedick to challenge Claudio to a duel. Of the all star cast, Branagh, Thompson, and Washington particularly distinguish themselves. Their fluid use of Shakespeare's language renders it both poetic and comprehensible to modern ears. 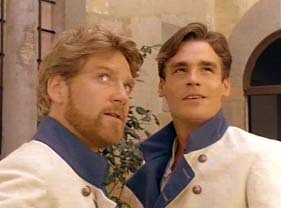 Branagh & Thompson are great together as warring couple, Benedick and Beatrice, adding much to the plot line and enjoyment of the movie. 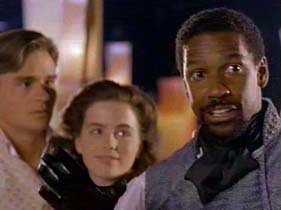 Denzel Washington plays Don Pedro of Aragon, who is the head military leader of all the soldiers, (including Claudio, & Benedick), who had all come to enjoy the hospitality of their friend, the Governor of Messina, played well by Richard Briers. The beginning of the movie has them coming back from a campaign for a visit. Richard Briers excels as Hero's father, Seigneur Leonato, the Governor of Messina, who is put through the ringer by the false accusations made against his lovely daughter. Some people feel that casting missed its mark, concerning Keanu Reeves (Don Juan) and Michael Keaton (Constable Dogberry), who seem to many oddly not quite right for their roles, being two very modern actors, who seem out of place in the period setting. I personally thought that Reeves was fine as the bitter, full of hate, vengeful brother of Don Pedro, which was a shallow, one note character anyway. Michael Keaton's performance was over the top, perhaps needing stronger direction, but was his comical self, true to form. Branagh impressed audiences around the world when he performed the same tasks on Shakespeare's "Henry V" (1989). He received Oscar nominations for Best Picture and Best Director, causing some critics to proclaim him the modern heir to the late Sir Lawrence Olivier's illustrious dramatic crown. The film's beautiful photography, which presents the past era in an eye pleasing, gold-tinged light is a delight for the viewer. Director of Photography Roger Lanser delivered the ripe, sumptuous visuals. The film was beautifully shot on location in Italy, in and around the 14th century Villa Vignamaggio. 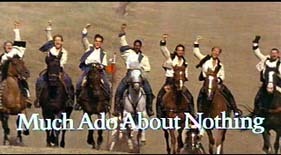 If you enjoyed MUCH ADO ABOUT NOTHING, you may like"Henry V", "Sliding Doors," "The Taming of the Shrew," "Twelfth Night: Or What You Will," "A Midsummer Night's Dream," and/or "Romeo and Juliet."